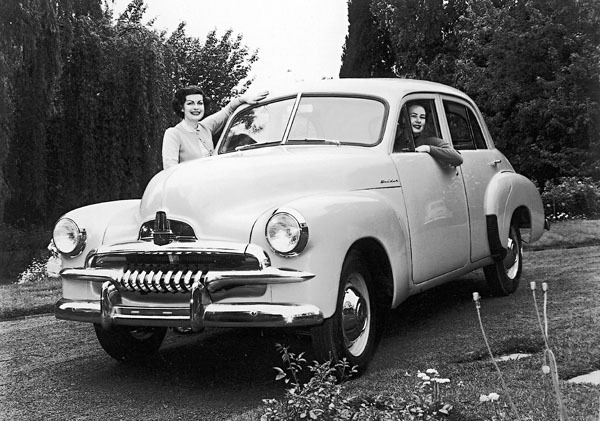 The FJ Holden was launched in October 1953, and although not the first Holden but an updated version of a car that was nearly five years old it has become the icon of Australia in the 50s and 60s. The FJ introduced the long-running Holden policy of facelifting. No glassware or external sheet metal was changed, the main styling changes being a new grille, different hubcaps and bumper bars and more chrome on the body. Few changes were made to the mechanics; both engine and gearbox from the 48-215 were retained but some suspension improvements were made by replacing the lever-action cast-iron shock absorbers at the rear with a more durable telescopic type, adjustable differential centre and new axle shafts. Many of the limitations of its predecessor were retained including the 6 volt electrical system, manifold vacuum-operated windscreen wipers (with no washers), no demister, no heater, no blinkers, an ornamental handbrake and so on. Other items we today consider as standard such as a radio and instrumentation for oil pressure, temperature, etc were still listed as add on accessories even in the so called FJ Special or deluxe model. In spite of this in just five short years it had become the almost universal choice of the most demanding buyers of all: taxi drivers, commercial travellers, farmers and tradesmen. Sedans came in three versions; the Standard, Special and Business sedans. By the end of 1953 these were joined by a coupe-utility and a panel van body style. The wagon was not included in the range even though prototypes were produced as the factory was flat out keeping up with the demand for the available range. Those who wanted a wagon had to buy a panel van and a conversion kit which contained windows and a rear seat in a sort of D-I-Y wagon deal. The FJ was the first Holden to be exported with 100 per month going to NZ by 1955; by the early 1960s Holdens were going to over 50 countries, including Japan with one in every four earmarked for export. The FJ offered a greater list of options than its predecessor including a range of 12 colours, a more elaborate interior with dual-coloured door trims on the Special which also featured armrests and a cigarette lighter. It also came in a two-tone exterior colour scheme with more chrome inside and out. Although now looking dated compared with newer models from other manufacturers, it still offered great value for money, an unbeatable reputation for ruggedness and continued to sell well until July 1956 when it moved over for the more modern, Oz-designed FE model.